There are many reasons why RHRLI treats hair loss, and one reason is related to obesity. Obesity has become an epidemic in the United States. According to the Centers for Disease Control and Prevention, the obesity rate among adults is 39.8 percent or about 93.3 million Americans. Obesity boosts a patient’s chances of having heart disease, stroke, and type-2 diabetes. As of 2008, the last year we have statistics for, obesity costs the US $147 billion. It’s critical to treat obesity, and one treatment that has become quite common is bariatric surgery. 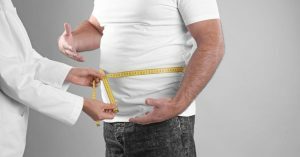 These procedures allow patients to lose weight by restricting the amount of food they can put into their stomach, according to The American Society for Metabolic and Bariatric Surgery (ASMBS). Some common bariatric procedures include gastric bypass surgery, sleeve gastronomy, Biliopancreatic Diversion with Duodenal and the adjustable gastric band procedure. One side effect of bariatric surgery you may have heard about is hair loss. RHRLI wants our patients to know about all types of hair loss, so we want to explore the relationship between hair loss and bariatric surgery. According to the Texas-based, DFW Bariatric Institute, hair loss after bariatric surgery is common. The type of hair loss most associated with the aftermath of bariatric surgery is telogen effluvium. This is a form of hair loss that’s related to the hair loss cycle. According to Medical News Today, telogen effluvium is associated with the hair growth cycle which is made up of a growth phase, a transitional phase, and a resting phase. During the resting phase, shedding occurs. Patients with telogen effluvium shed hair while hair that’s supposed to be entering the other stages of the cycle aren’t doing that. One of the causes of hair loss by telogen effluvium is stress. Hormonal imbalance such as hypothyroidism. Crash dieting, anorexia, low protein intake, and chronic iron deficiency. Reactions to medications such as beta-blockers or excess vitamin C.
In most cases, hair will return naturally, except in cases of chronic diseases. While waiting for the hair to grow back often works, there are other steps you can take, and it’s recommended you talk with your primary care physician. There are going to be dietary considerations. You might want to limit excessive Vitamin A while adding B vitamins and fish rich in omega-3 fatty acids. Women can be particularly susceptible to hair loss after bariatric surgery. Some women with iron deficiencies may need to add more iron to their diet. One bariatric patient we spoke to said she was prescribed multi-vitamins before the procedure, as well as calcium and B12 supplements. Fortunately, this patient didn’t lose more hair than usual, but it took a long time for it to start growing again. Patients are advised that it can take over a year to resume hair growth, she said. For those who have experienced permanent hair loss due to complications related to weight-loss surgery, RHRLI wants you to know that we offer a permanent solution to hair loss. It’s called the ARTAS® system, and it uses robotic technology to perform a hair transplant procedure with more precision than any other method out there. It’s also a minimally invasive procedure that will allow you to return to your normal life quicker than procedures that involve scalpels and sutures. To learn more about The RHRLI Edge and contact us today!